The next generation of high-performance Intel Xeons will be the second stage of Intel rearranging its professional stack. Stage one was separating chipset requirements of low core count Xeons from the consumer counterparts, but stage two to occur later this year will be something to wrap your head around. We still haven’t confirmed most of the salient details, such as significant changes in the naming and strategy when it comes to socket and die differentiators, but what we do know is that the large E5-class Xeons (some of which may or may not get a name change from –EP to –SP) will be in the LGA3647 socket, which is exactly where the current generation of Xeon Phi, Knights Landing (KNL), also sits as they will be pin compatible. So for the most part, E5 CPUs will move from the current LGA2011-3 sockets up to a much larger design, and rather than go into the details of what that means, this news post is more about seeing motherboards that support them in the wild. We expect to hear more about the new Skylake-SP Xeon platform in the summer, probably at IDF in August, but for now we get to gaze on accidental leaks like this one. Exxact Corp, an Intel enterprise system integrator, posted up details regarding a pair of upcoming motherboards from Tyan, a well-known Intel enterprise motherboard manufacturer. 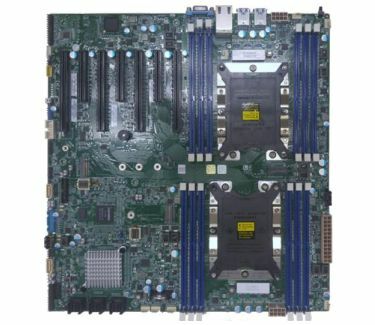 These motherboards use a pair of LGA3647 sockets on the top of the board, with the DRAM slots above and below to assist with airflow through a server. As with some of the 2P motherboards we see today, the sockets are slightly staggered due to connectors and trace layouts, but both sockets exhibit a full six channels of DRAM with one DIMM per channel (1 DPC, we expect Skylake-SP Xeons to support 2DPC or 3DPC depending on the model). While the image is small, and low quality, some determinations can be made. The specification list of the TYAN S7100GM2NR (and TYAN S7100AG2NR) is fully listed on the SI website as well. Each socket will support a TDP of 205W, which is up from the previous maximum of 160W on CPUs like the E5-2687W v4 that were focused on high performance. This might mean that Intel is targeting an even higher window for their CPUs, or there will be added silicon on board (how Intel plans to integrate FPGAs into the ecosystem is still unconfirmed, but rumors have been surfacing), or the fact that Xeons might be paired with Knights Landing Xeon Phi chips, which are currently offered from 215W to 260W. Technically that is above the socket TDP for this Tyan board, but that might be because of how the Tyan board expects to be positioned without Xeon Phi, and we might see motherboards with higher TDP ratings and the power delivery to back them up. The chipset is listed as Intel’s C621, which is not listed on ark.intel (the site that holds Intel’s chip specifications), indicating it is a new chip. Typically the chipsets ending in ‘1’ are the low-end models, with Intel putting C608, C236 and others at the top of their respective stacks. The website where the Tyan motherboard is listed also states 'LBG-1G', which is a secondary indicator of the chipset and it's capabilities. We have seen documents signalling potential different types of Intel chipset for the SP platform, and this corresponds with one of those, particularly the '1G' part which is a nod to the fact that this chipset will directly support gigabit ethernet. We won’t comment on unconfirmed details regarding the chipset stack from Intel, however it is expected that the capabilities of the chipset stack will be expanded for Skylake-SP compared to older platforms. With the memory, the website confirms six memory channels per CPU. The website states that the board can support 768GB of RDIMM/LRDIMM DDR4-2666 memory, and given that we have 1DPC this means that the support is the sum across both sockets, leading to 64GB modules maximum. PCIe support shows four primary PCIe 3.0 x16 slots, interspersed with secondary PCIe 3.0 x8 slots. With experience, these secondary slots are most likely switched with the primary slots, such that when occupied the primary slots are reduced to PCIe 3.0 x8 bandwidth. Even with the low-resolution image, it is clear that there is no big PLX 8000-series or 9000-series PCIe switch chip-on-board, suggesting that these lanes are all native to the CPUs. As the board supports four PCIe 3.0 x16 slots natively, this indicates that either a single CPU can support 64 PCIe lanes, or that each CPU takes 32 PCIe lanes. We would expect the latter to be the case for this generation of Xeon processors. Additional to the PCIe slots, there is some storage in PCIe form, with a single M.2-2280 slot being listed as from the CPU, and supporting PCIe 3.0 x4. This most likely comes at the expense of a PCIe 3.0 x8 (as in, when the M.2 is installed, a PCIe 3.0 x8 is either disabled or drops to a PCIe 3.0 x4), depending on exactly how the PCIe root complexes are configured in the Xeons. If the Xeon has a full 40 lanes, installation of M.2 storage probably has no direct effect. 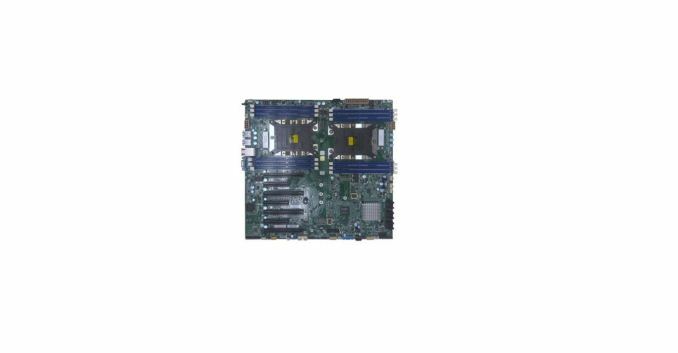 For other storage, the website lists an M.2-2242 slot as supporting PCIe 3.0 x4 from the chipset. These new chipsets may mirror the newer consumer chipsets by having plenty of PCIe lanes free for this sort of configuration, though the interesting thing here is limiting it to the 2242 size. There are enterprise drives available in 2242 (and a few consumer ones), although at that size you have limited dies to take advantage of the parallelism needed to saturate a full PCIe 3.0 x4 slot. Along with the PCIe storage, the motherboard will also support 14 SATA 6Gbps ports, all listed as being from the chipset due to Intel RSTe 5.0 RAID support. This would indicate that the new chipsets also have increased native SATA capability (previous generations had 10 SATA ports, of which only six were RST capable). Other connectivity on the boards is listed in terms of Ethernet (two gigabit RJ45 ports from an Intel I350-AM2 controller), USB 3.0 ports (four on the rear) and TPM support. The two boards from Tyan differ in the IPMI and Audio: the S7100GM2NR has the Aspeed AST2500 BMC with iKVM and IPMI, whereas the S7100AG2NR has a Realtek ALC892 audio codec instead. With a larger image of the motherboard, more analysis may have been possible. But seeing this motherboard being listed this early, and publicly, is unexpected (and probably breaks someone's NDA along the line). Nonetheless, system integrators like this are reaching out to potential partners for sales and taking inquiries about future product designs. Many thanks to @momomo_us for the link.